Review The Powers That Be at El Reg originally asked me to take a shufty at the Ouya gaming box when it first launched in the middle of 2013. I demurred. It seemed obvious to me at the time that the success or failure of this Kickstarter poster child would depend entirely on the enthusiasm with which game makers and the wider developer community clasped the Ouya to their respective bosoms. Six months after release it is a different kettle of fish - there has been ample time for everyone concerned or interested to get their act together and their ducks in a row. The question, then is: Is the Ouya worth 99 quid? 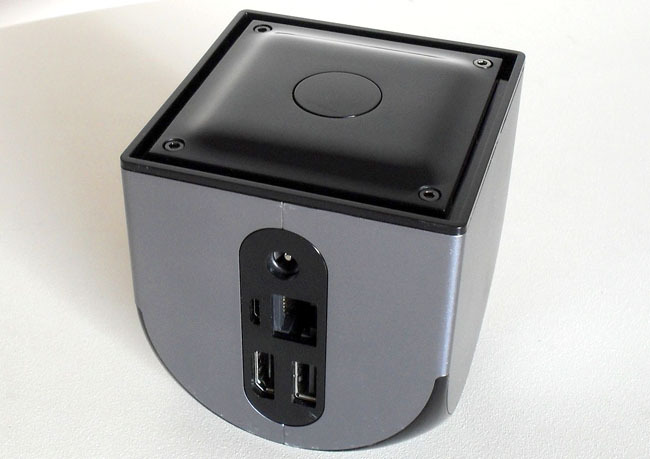 For just shy of 100 notes you get the stylish and dinky little Ouya box, which comes complete with USB, Micro USB, HDMI and Ethernet connectivity, a power supply, an HDMI cable and a conventional-looking PlayStation-style controller. I’ve heard people slate the controller for being cheap and nasty, but once you’ve got the batteries (supplied) slotted into each of the two hand grips, it feels solid and weighty enough and does the job with little discernible pause or lag. It’s not the best games controller I’ve ever used but nor is it close to the worse. Extra controllers will set you back around £37 a pop which is wee bit steep when you consider that a swish Sony DualShock 4 can be yours for £50. Usefully, a small black area in the centre of the controller is a touch pad. This makes navigating around with the Ouya’s underlying Android 4.1.2 OS so much easier than it would otherwise be. 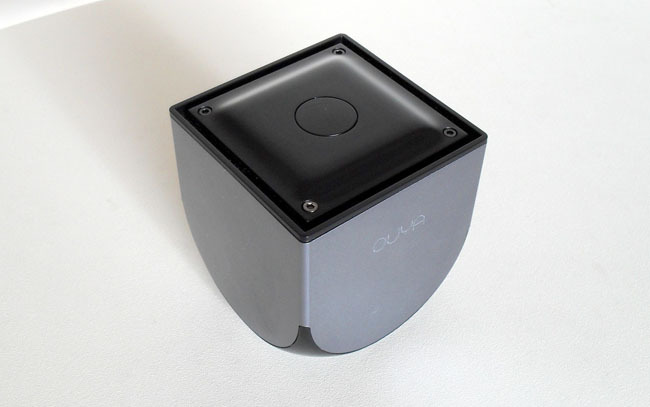 The altogether higher quality Ouya box is an impressively stylish and small affair, though it looks like it's upside down. It’s powered by an Nvidia Tegra 3 processor with 1GB of RAM. That’s the same hardware spec as the original Google Nexus 7 tablet. As a specification, it was a tad dated at launch and is now almost antediluvian. But all the games I played looked good and ran smoothly and it pumped out a 1080p video signal without any problems. It’s a very quiet device too, emitting barely more than a whisper even when the cooling fan was running. 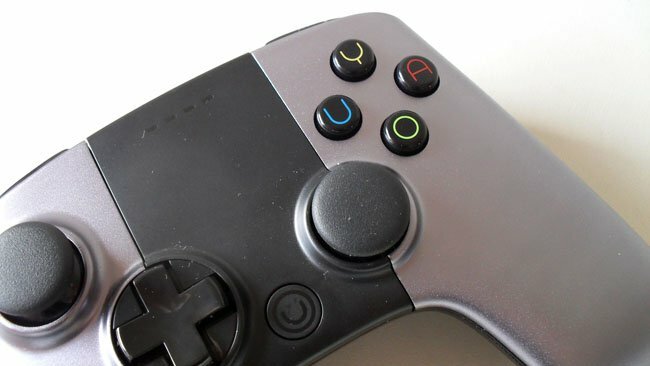 The controller connects to the Ouya console using Bluetooth. If you leave it alone for more than five minutes, the connection is severed to save power. This can take a while to get used to and on several occasions it took a moment or three for me to realise it had stopped working. 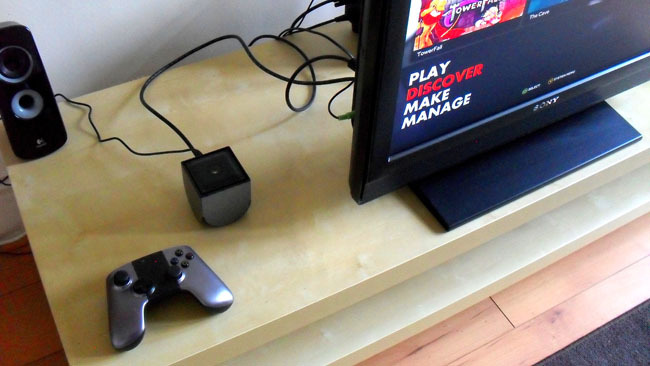 Connecting the Ouya to your Wi-Fi network and the controller - up to four are supported - to the console is child’s play and the work of mere moments. There’s only 8GB of built-in storage, falling to around 5.6GB after the system has put its tanks on the lawn, but a software update last year added support for external USB storage which you can use to store media files or downloaded apps and games. Stuff a 64GB stick in the Ouya’s rear slot and you should never want for space. The Ouya’s user interface now feels a lot less beta than it did at launch. Apart from just looking smarter, a double tap of the Ouya button on the controller while in a game now pulls up a system menu rather than just quitting play. It’s now all just a lot more user friendly than it was back in the summer, vital for something being pitched to the casual gamer rather than a machine aimed at the sort of chaps who spend whole weeks locked away in a dark room playing Call of Duty or Grand Theft Auto and avoiding showers. I certainly can’t accuse Ouya of neglecting its little box of tricks either. In the month I had my review unit, two new system updates rolled down the ’pike, each making the console just a little faster and easier to use. At launch, the Ouya got a bit of a kicking over the lack of games, deservedly so. There were fewer titles in the Ouya library than there are 20 pound notes in the wallet of my great-grandfather Hamish McTaylor, and many of those that were available were of questionable quality. But six months on and things have taken a turn for the better. Looking at random for three games I’ve been playing on my Nexus 7 recently I found Neon Shadow was available as was Shadowgun, though Dead Effect was missing. But as Meatloaf said, two out of three ain’t bad.